This year at Thanksgiving, the unthinkable happened: there were no fresh cranberries to be had. 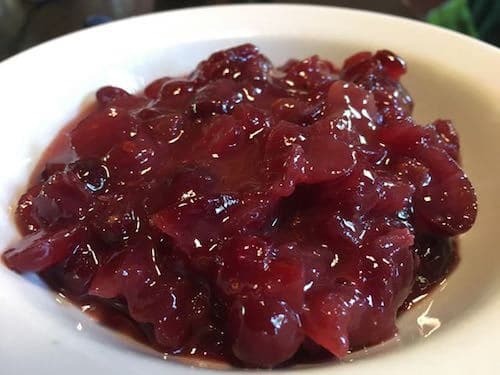 Apparently cranberries just didn’t make it to Guatemala this year, so my grandmother’s Cherried Cranberry recipe was off the table (so to speak). I couldn’t stand the idea of canned cranberries, so I bought a small bag of dried cranberries and started playing. The dried cranberries I get are all made with sugar, so I didn’t want to add more sugar to the mix. If you have sugarless dried cranberries, you might want to add some sweetness. These turned out surprisingly well. Not the same as fresh, but loads better than anything from a can. In a medium saucepan, stir together the cranberries, orange juice, grated orange peel, and salt, then bring to a simmer. Continue simmering until the cranberries are rehydrated. Add the cornstarch and water mixture to the pan. Stir and simmer until the sauce is thickens a bit. Allow the sauce to cool before serving: it will thicken a bit more as it cools.